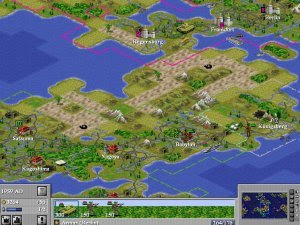 The game is based on Microprose's famous Sid Meier's Civilization and has many basic ideas in common with it. Actually, this project has arised from the wish to correct annoying design mistakes and AI weaknesses of Civ II. The priorities of the C-evo project are considerably different from big commercial games. While those are focused on easy entertainment and mainly compete for the most realistic and exciting up-to-date multimedia, this one aims at ageless challenge.